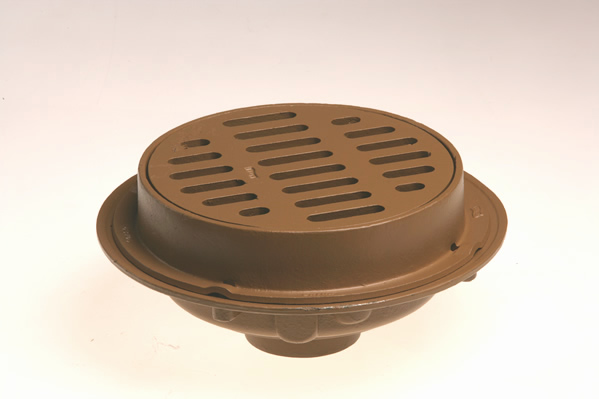 2233 Side Outlet Heavy Duty Floor Drains with 12" Round Tops - Jay R. Smith MFG Co.
Used in heavy trucking areas where debris is anticipated and must be intercepted. The suspended sediment bucket when set under the grate guarantees efficient interception of debris. Duco Cast Iron Body and Flashing Collar with Cast Iron Tractor Grate and Slotted Sediment Bucket. Smith No. 2233 (-G) galvanized cast iron 12” diameter drain with sediment bucket and heavy duty tractor grate.The suspended sediment bucket when set under the grate guarantees efficient interception of debris. See Smith No. 2238 (-G) for side outlet. Smith No. 2233 cast iron drain with flashing collar and bucket with nickel bronze top. The suspended sediment bucket when set under the grate guarantees efficient interception of debris. See Smith No. 2238 for side outlet. Smith No. 2233 cast iron drain and sediment bucket with tractor grate. Smith No. 2238 for side outlet.